It was no instant success, but gradually, the group’s new marriage of pop and orchestral ingredients began to turn heads. 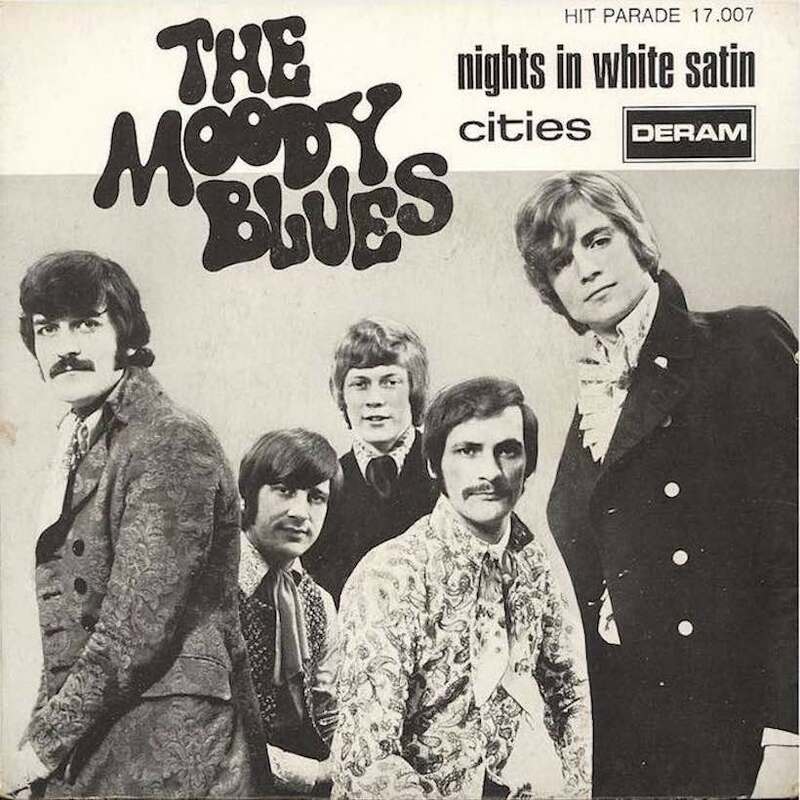 In the timeless flight of the Moody Blues, ‘Nights In White Satin’ is such a classic that it’s strange to recount the slow, almost faltering progress of this epic ballad when it was first released. 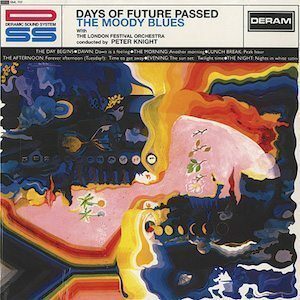 Justin Hayward’s song, and its parent album, the Moodies’ career-changing Days Of Future Passed, were both released on 10 November 1967 — and for the first few weeks of their lives, the sum total of their UK chart presence was precisely nil. But gradually, the group’s new marriage of pop and orchestral ingredients began to turn heads. With the additional attractions of Mike Pinder’s keyboard effects on the Mellotron, little-used in popular music to that point, and Ray Thomas’ flute, both the single and the album began to capture the imagination of both the public and the media. ‘Satin’ may have had an uncertain start, but few singles have gone on to such recurring and multi-faceted success, both in the UK and around the world. After attracting radio support, the single on Decca’s Deram label finally made the British Top 50 in the first week of 1968, some seven weeks after release. It was the first chart appearance of the Moodies’ new line-up, retooled with the addition of Hayward and John Lodge, and the first time the group name had been on the UK singles list for more than two years, since ‘Everyday’ limped to No. 44. Even then, ‘Satin’ only just clambered onto the bottom rung of the Top 50, as The Beatles continued at No. 1 into the new year with ‘Hello Goodbye.’ The ballad then climbed to No. 35, making less than spectacular progress over the coming weeks before coming to a halt at No. 19 on the 20 February chart. It fared much better elsewhere, going all the way to No. 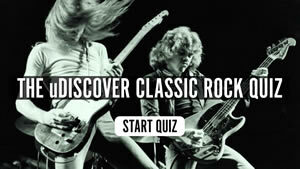 1 in 1968 in Holland, and reaching the top ten in Austria, Belgium and Switzerland, and the top 20 in Germany. The initial UK activity was enough to kick-start Days Of Future Passed, which showed up on the bestsellers for the first time in late January 1968 and got as high as No. 27 in both February and March. The album reappeared from time to time over the next few years, making its last showing in 1973. 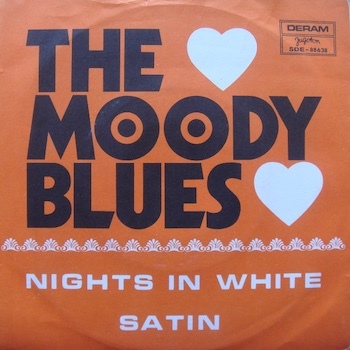 By then, with the Moodies established as a major album and touring force, ‘Nights In White Satin’ had belatedly become a massive hit, reaching No. 2 in Billboard and No. 1 in the rival Cash Box countdown. That transatlantic success, in turn, prompted the first reissue of ‘Satin’ in the UK, where it charted anew and became a much bigger hit second time around. The song spent three weeks in the top ten in late ’72 and early ’73, landing at No. 9. In 1979, it rose once again, in a new 12-week run that gave it another five weeks in the top 20 and a No. 9 peak. This historic recording even managed one further chart week in 2010, prompted by a performance of the song by the eventual winner of that year’s X Factor series, Matt Cardle. Those satin sheets that inspired Justin Hayward were made of the most enduring material. ‘Nights In White Satin’ is on Days Of Future Passed, which can be bought here. Having been to see the Moodies only nine times, I cannot say they are one-hit wonders. After all, I have all their albums and now I’m doing their sheet music on my Yamaha keyboard. All I know for sure is that, “Nights In White Satin”, is the best R & R Song of all time. Your band had had a influence on me since the late 60’s . My son of 28 years took the name of Justin . Yes you guys make the famaliar sound that only the Moody Blues can make. I have seen you in concert full orchestra in Charlotte North Carolina . Thank you my quality of life is better listning to you . Your music is everlastning. One Strange Trip , riding my sea saw . To the real Nights And White Satin . From Larry Wayne Davis . Days of Future Passed is a true work of art. I was introduced to it one night late on American FM radio in the mid 1980s quite by accident when I was alone working at an all-night job. It immediately became one of my favorites.